Nice staff, clean and nice designed room, good breakfast. Good sized room. Fast efficient check in. Quiet room. Nice hotel with good location - just near city center. Clean rooms, good breakfast, ideal for short stay. Excellent location, with a great view of the House of Parliament and within walking distance to Izvor subway station and the Old Center. The staff at both the hotel and restaurant were great and the breakfast was really good. Definitely recommend it! View was ok overlooking an open area rather than other buildings. A new cathedral is being built so the view should be better in the future. Also it's 8 minutes walk from the nearest underground station was a plus. I got there at 9 a.m. and they gave me room.That was awesome for me. ibis Bucuresti Palatul Parlamentului This rating is a reflection of how the property compares to the industry standard when it comes to price, facilities and services available. It's based on a self-evaluation by the property. Use this rating to help choose your stay! Hotel Ibis Palatul Parlamentului is located in the center of Bucharest close to the Palace of Parliament, offering nicely equipped rooms with free WiFi internet access. All units are air conditioned and fitted with cable TV and a private bathroom with a shower and free toiletries. The hotel is close to the financial district and it is 12 mi from Otopeni Airport. You can sample Mediterranean cuisine at the Sud & Cie Restaurant. There is also a lobby bar at the Ibis Palatul Parlamentului, which is open 24 hours. When would you like to stay at ibis Bucuresti Palatul Parlamentului? Functionally furnished room featuring free Wi-Fi, cable TV, and a private bathroom with a shower. Functionally furnished room featuring free Wi-Fi, cable TV, and a private bathroom with a shower or a bathtub. This room features air conditioning, free Wi-Fi, a TV and a sofa in the living area. The private bathroom comes with a shower and a bathtub. A work desk is available. Hotel surroundings – This neighborhood is a great choice for travelers interested in architecture, old-town exploration and food – Check location Great location - show map Guests loved walking around the neighborhood! 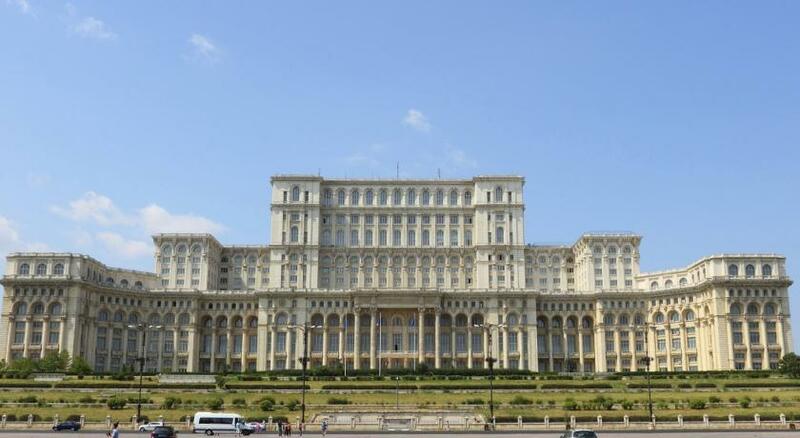 House Rules ibis Bucuresti Palatul Parlamentului takes special requests – add in the next step! ibis Bucuresti Palatul Parlamentului accepts these cards and reserves the right to temporarily hold an amount prior to arrival. In the morning the ladies with cleaning make a lot of noise. It is not important for they that is Sunday or is too early for vacuuming. You could hear people moving in the corridors, constantly opening and closing doors from early morning. Fantastic all you can eat breakfast! Good location for sight seeing of Bucharest. Staff was nice and helpful. Smoking and nonsmoking rooms and floors available. When we arrived we were told that only smoking rooms were available. I do not remeber whether I clicked on this option when booking via bookig.com but I'll make sure to do it in the future. It took us 15 minutes to explain to the staff that we will not stay in a room for smokers. They were not at all flexible and helpfull in finding a solution. At the end, to our big surprise, they did find 2 non-smoking rooms (we were 3 girls - colleagues). So first, when booking this hotel, make sure you click on "non-smoking room" and second, if they say they are full and they have no non-smoking rooms, insist and insist! The breakfast was really good, there was a rich bufet with many freshly made meals (omelets, wafles, pancakes). It was a big noise from the cleaning staff and some bad smell on the floor. The location, the staff, the room was ok.
A little speedier early check-in would have been great, as time was of the essence, yet there were no rooms available that early in the morning, even if the cleaning staff were to be available (normally they begin working at 07:30 am). Friendly, kind & helpful staff. Early check-in was possible for a fee, even though it was not requested at the moment of booking, but later on by phone. Good coffee at the bar. I was given a smoking room in all-smoking floor (yes smoking is allowed in the rooms and the hotel has 2 floors for smokers! and I have never smoked in my life). They told me it was "for my security" (?!) and told me to open the window if I did not like the smell. The room was horrible and smelly, and I told them I would get a migraine right away and that I was on business trip, so I could not afford to be sick. They told me there were no other rooms in the hotel, even if at the same time they gave out rooms in non-smoking floors to other persons checking in. Finally, after more than half an hour they agreed to give me another room, which still smelled slightly of smoke even if a non-smoking room. But the room door did not lock! It was only possible to lock the room from inside, not when leaving the room. I asked for assistance, but at that time I had already packed my bags and just wanted to leave. I never received any apology nor any reduction on the room price. I cannot recommend this hotel. Nothing. I would not return to this hotel unless I was a smoker. Breakfast could have more variety and the coffee was watered and weak. Location is good, walking distance from the centre, which offer many opportunities to enjoy your spare time. The a young girl of the staff did not allow me to pay with my prepaid Mastercard card , although I knew from my colleague who checked-in there the day before that she was allowed to pay with a prepaid card!